The location is near by Shanghai refrigeration fair, around 15 minutes by taxi. Subway only 4 minutes walk. One of the staff was very helpful despite he was not talking English. He gave me a fruit and change my room as it was smell like a cigarette. Housekeeping did a great job, room was clean. Free water bottles in room. Front desk staff were helpful. Breakfast buffet was convenient. Short walk to public transportation. Free wifi was available but without internet.... so it is cheating. misleading …. I like it's location. close to the metro. The staff were very nice and give me help as much as they can. The hotel is a 5 minute walk from the conference center. The rooms are clean and quite comfortable. I like the location just few minutes walk to the subway. basically Chinese style breakfast, very convieient location. no surprise. Breakfast was included and had lots of options. Computers and printer available at no charge. Choice of pillow firmness. Airport taxi waiting as requested. 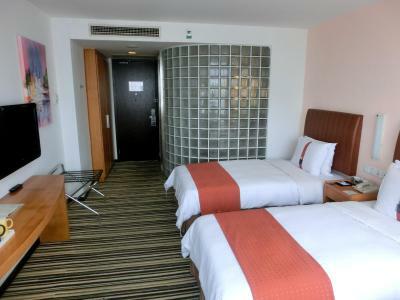 Holiday Inn Express Shanghai Jinqiao Central is situated in Pudong Jinqiao’s business district. It features a restaurant and rooms with flat-screen cable TVs. Free internet and parking are available. 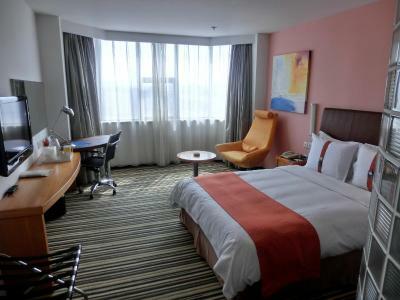 The elegant rooms at Express Shanghai Holiday Inn are equipped with large windows that offer plenty of natural light. Amenities include a safe and tea/coffee maker. 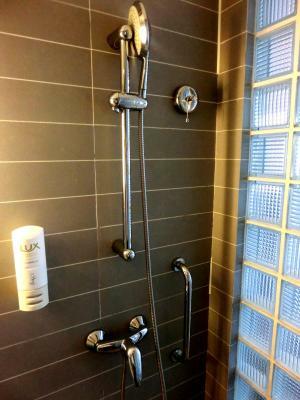 Hot shower facilities and toiletries are provided in the private bathrooms. Guests can have their meals at the on-site restaurant, which serves a spread of local and international cuisine. Shanghai Jinqiao Central Holiday Inn Express is next to Waigaoqiao Free Trade Zone and is a 30-minute drive from Pudong International Airport. 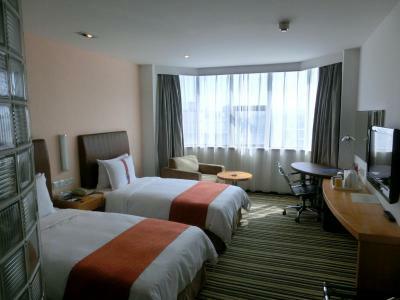 When would you like to stay at Holiday Inn Express Shanghai Jinqiao Central? 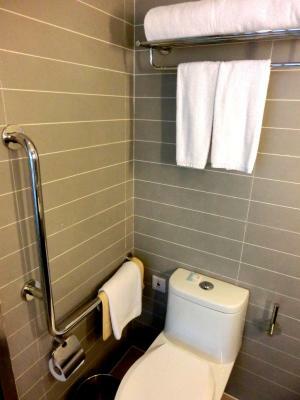 An air-conditioned room with a private bathroom, a sitting area and a flat-screen cable TV. Holiday Inn Express Shanghai Jinqiao Central is an international business hotel managed by InterContinental Hotels group. 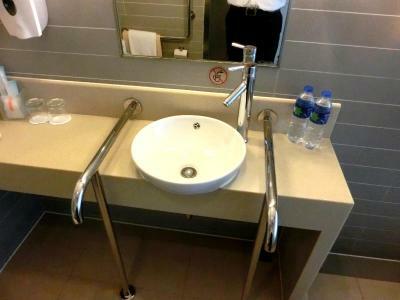 It used to be one of the official hotels for 2010 Shanghai Expo. The hotel is located in Jinqiao, close to Jinqiao Export Processing Zone, Zhangjiang Hi-tech Park and Jinqiao International Business Plaza. It takes you 25 minutes to get to the Lujiazui Financial and Trade Zone, 35 minutes to get to Pudong International Airport and only 20 minutes to get to Pudong New International Expo Center from the hotel. House Rules Holiday Inn Express Shanghai Jinqiao Central takes special requests – add in the next step! One older child or adult is charged CNY 79 per person per night in an extra bed. Greatwall Peony Dragon Pacific Jin Holiday Inn Express Shanghai Jinqiao Central accepts these cards and reserves the right to temporarily hold an amount prior to arrival. Holiday Inn Express Shanghai Jinqiao Central accepts these cards and reserves the right to temporarily hold an amount prior to arrival. Breakfast. not meeting with expectation. the hotel does not offer currency exchange service for USD to RMB or any other currency. The breakfast should add further veg and halal food options. location is good, near the Jinqiao road station. Breakfast needs improvements. English communocation not upto the std. Breakfast, poor english speaking - It was tough to communicate. Compact, Room facilities, location etc. In the restaurant on the ground floor some of the chairs were not very clean. The rooms that face the highways are extremely noisy. I had to ask to be moved to the other side. The employee at the front desk are very helpfull and speek english fluently. Poor staff attitude. Allowed smoking in non smoking areas and rooms. The entire Hotel smelled. We ended up canceling 3 nights and moved to another hotel.